I came up with a bit of stilted rhyme and gutter prose, as part of the campaign to end fossil fuel subsidies at the Rio+20 talks. Why should a trillion dollars of taxpayers' money go toward propping up industries we don't particularly want, which are responsible for large-scale environmental degradation, and whose owners are major champions of supply-side economics anyway? So, we pay, to sell our future down the pipelines of despair? Do we stand, aside and let the pillage show how not to care? Shall we subsidise the dying? Or invest in futures flying? Can we stop, supporting things that cannot/never will sustain? And instead, uplift the industries that need not stunt our gain? Shall we end the past's sad errors, and embark on new endeavours? One man once, stood firm and asked the leadless past to step aside. Once more, today, there is a chance to take the future in our stride. We can make an end, and make amend. Speak out! Make good ancestors of us all! 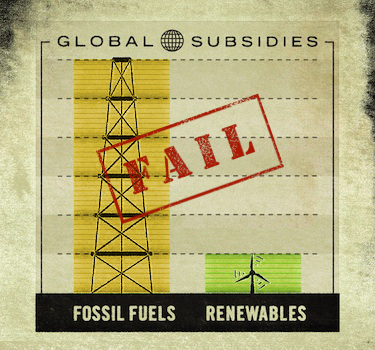 For us rubes please give details(the hows and whyforths) & $ of fossil fuel subsidies.